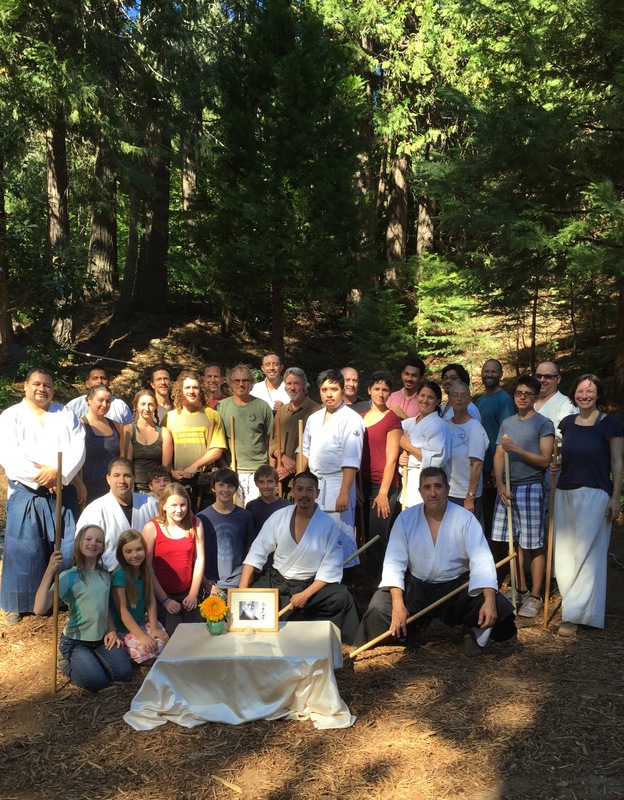 Our Grass Valley Aikikai Mountain Weapons Seminar with Elmer Tancinco Sensei, on July 23rd has come and gone. Resting afterwards and reflecting back on the experience, my mind is flooded with images and emotions. As the host I should show humble modesty, but it was a grand seminar! I bought my home on 10 acres in the Sierra Nevadas in 2004, and from that time until now I have dreamed of having an outdoor weapons seminar. At long last the stars have aligned and it has come to pass! It was an experiment, I didn’t know if it would work out. I worried people would find it too hot, too dirty, too buggy, or too far to drive. I was prepared to have it be just a handful of my own students and Tancinco Sensei. Instead we had 36 people training, plus 9 more friends and family joined us for dinner. Judging by everyone’s faces and comments as they trained and then partied, and by all the Facebook posts afterward, the experiment was a success! Obviously, we will have to do it again! In retrospect we will have to rename this seminar the First Annual Mountain Weapons Seminar! 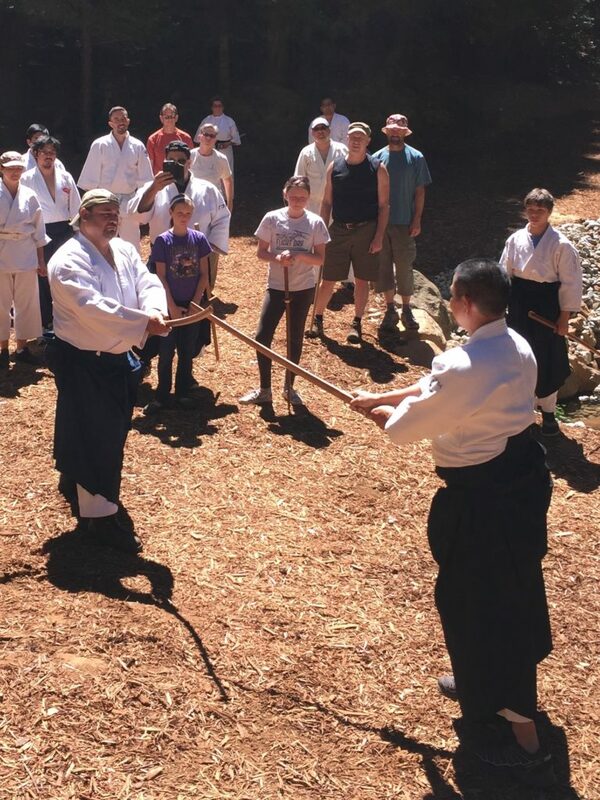 We had students come from Alameda Aikikai, Hayward Aikikai, Eastshore Aikikai, Aikido Institute of San Francisco, Davis Aikikai, plus Daniel Acosta Sensei from Mexico and Brian Batchley, formerly from Ventura Aikikai and now at-large in Paradise, California. 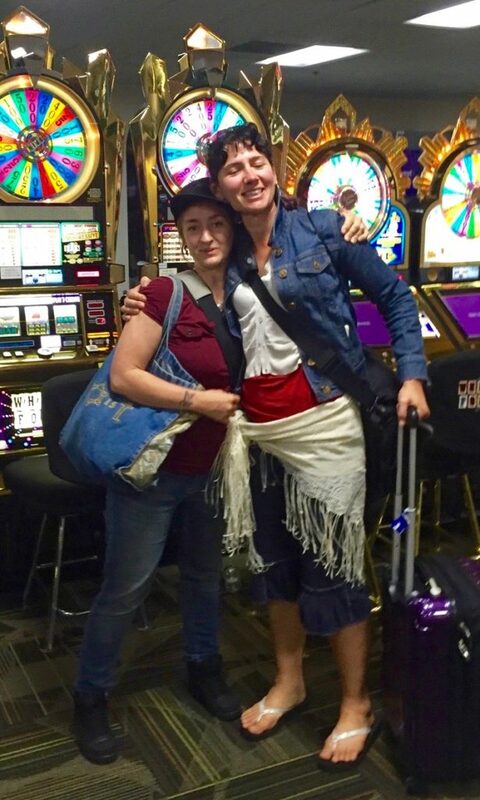 Lizzy Lynn Shihan, my dear friend, came too and lent her support. I was dumbfounded when sneaky Alex Peterson Sensei and his sidekick Karen Kalliel Sensei showed up unannounced to surprise me, having conspired with my students at summer camp. What a wonderful surprise it was! There was an element of stress for our family in preparing because we had decided to repair our pond. The pond was there when I bought the house. Originally it was a spring fed creek. A former owner dug it into a pond but didn’t do it right. It was pretty from a distance, but up close it was a mess, and it leaked. The project originally had nothing to do with the seminar, but the seminar date had already been set when we realized that we were in a position to finally rebuild the pond. Fred (my sweetheart and the cook) determined that it could get done before the seminar, rather than waiting until after. Naturally the project expanded and we kept adding things, like the Fred Flintstone outdoor kitchen, the terrace, the beach, and the wood chips! As the seminar date approached, we stayed calm, on course, and yet I am amazed that it came together in time. Many thanks to Fred’s son Forest (also the cook) and to my student, Kyle Comte, who labored like convicts in the hot sun moving rocks, and of course to Fred himself who was the chief architect and laborer! We have learned some lessons and it will continue to evolve. Obviously there will have to be an outdoor foot shower, after everyone was gone the house was full of sand! The aspect of the seminar that had to do with the training itself was Tancinco Sensei’s department. Of course, I knew he would do a great job, that’s why I invited him, but in my opinion, he seemed to rise to a new level. His teaching was so clear, so martial, funny at times, and kind. I could see every student pulled forward in their practice. 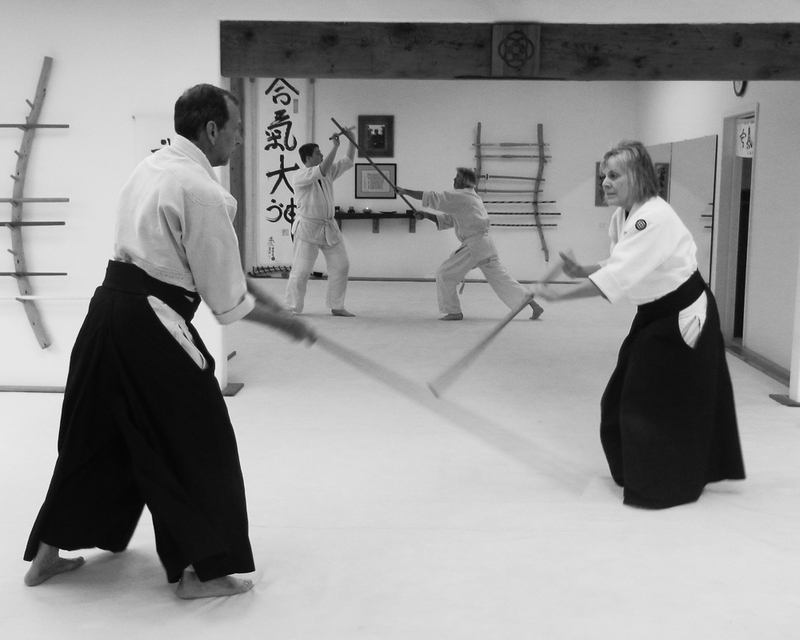 With first the bokken and later the jyo, he started with basics, then took everyone into deeper forms. JD Sandoval Sensei graciously served on the uke side, and between the two of them, it was something to witness. Here in Northern California we are very lucky to have instructors of such caliber. After the last class people swam in the pond, and dined outside. Later, those who could stay late sat up by a campfire. Tancico Sensei slept in a tent by the pond and Acosta Sensei slept under the stars. The next day he told me he had been a little cold, but said he had adjusted the blankets and was OK. That was when I realized I had forgotten to give him a sleeping bag! The two (very thin) blankets that he used, were to have protected the bottom of the tent (that he didn’t use). He is a pretty tough guy to sleep out like that. Sandoval Sensei, Bernadette, their two girls, and little dog took the attic. Lizzy Lynn Shihan was in the living room. Antonio and Joshua were outside in their RV. So it was a darn full house! 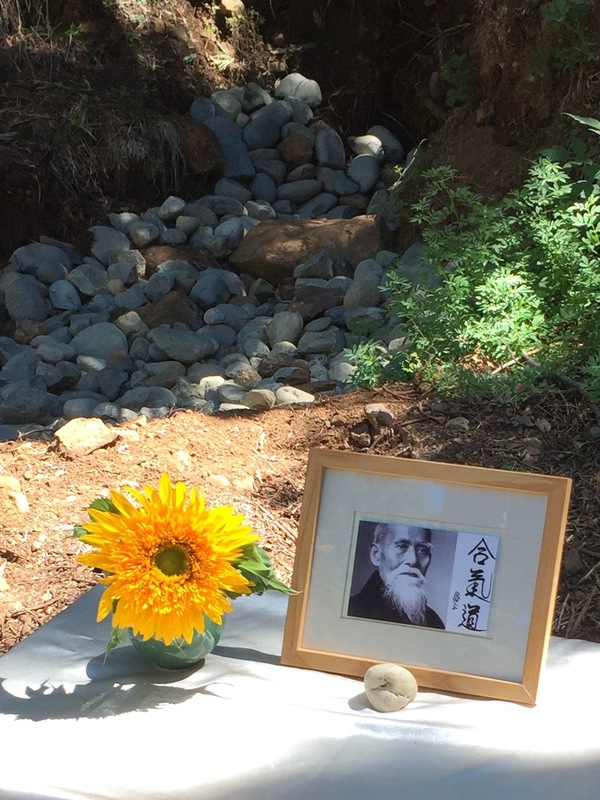 Just what I like – having a lot of aikido people all together. It was like summer camp for 24 hours at my home – heavenly. 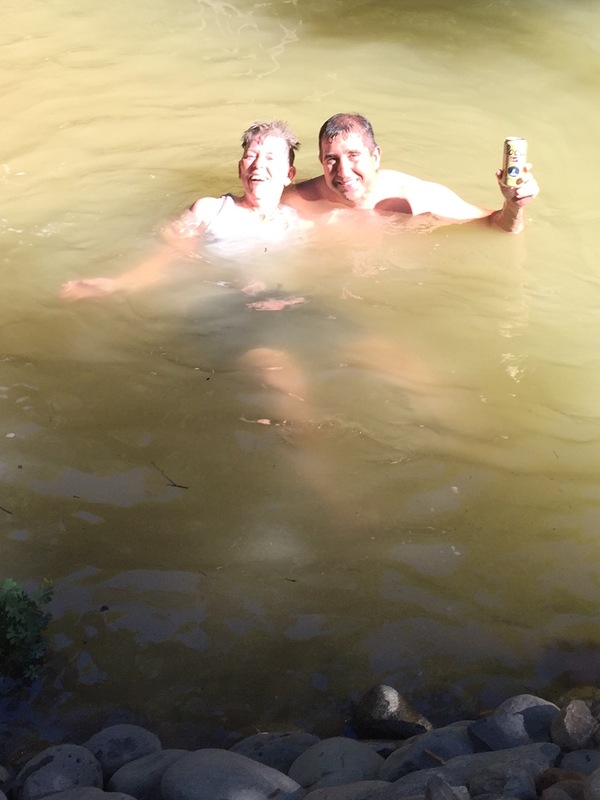 Peterson Sensei and Carol enjoying the pond! A wholehearted thank you to everyone who came. You made a dream come true for me, and now I can look forward to sharing the mountains with all of you for the rest of my life. Next year I hope even more Birankai students can come and continue our martial development, exploring our weapons curriculum, fighting the mountain. Work like this, through each of us, will make Birankai strong. 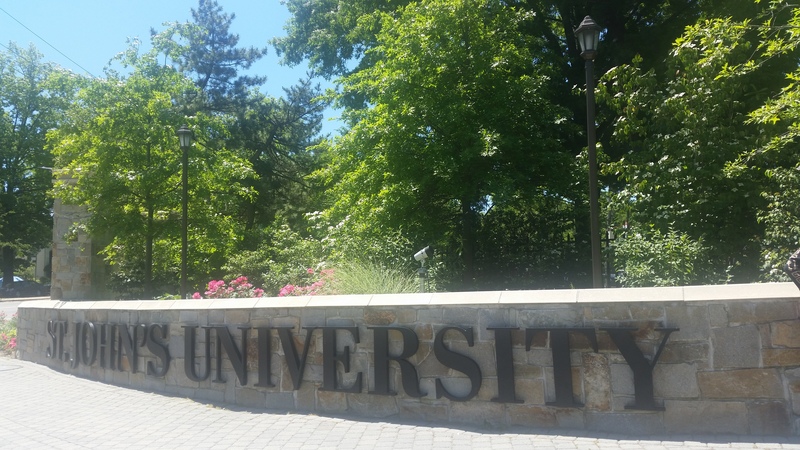 Touching down in NYC after a red-eye from Reno, Nev., my Sensei, Cecilia Ramos, my fellow student Marci Martinez and myself, excitedly made our way to the beautiful grounds of St. John’s University. After a short drive through Queens, admiring the sloped roofs designed for heavy snows of East Coast winters, the unfamiliar neighborhoods and the trees vastly different from those of my native California, we were dropped on campus with hours to spare before the first evening class. After a quick trip to the dojo to check out the mat setup, a short walk around campus, and registering among the first at camp (thank you, red-eye), we arranged ourselves in our quarters and got ready for the first class. My excitement and nervousness shared equal parts of my mental configuration. I have just taken on a new position for Birankai: editing this online newsletter. I knew coming to camp would serve as the springboard for this new position. I also knew I had big shoes to fill, as the retiring editor Liese Klein has held this position for the past 15 years. She has nurtured it through its adolescence, and created the profound resource it has become today for our Aikido community. Given the new position and the shoes to fill, I knew the heat would be on to meet any expectations that come with the job. Having been to camp only once before, ten years prior, I decide to leave any of my own expectations of what was to come back home. What I did expect, however was nothing less than good, hard, solid training. 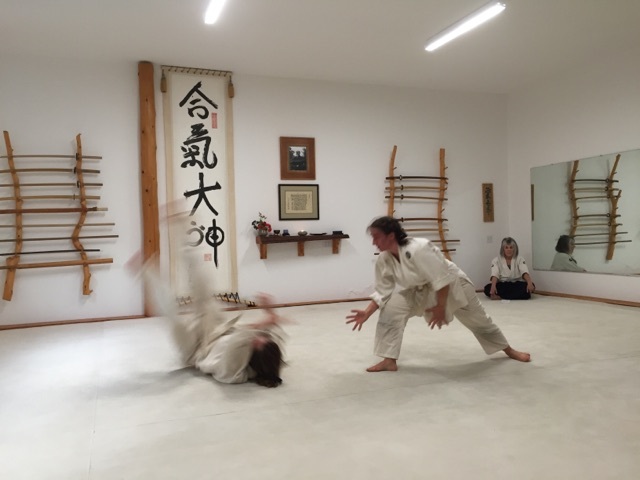 This expectation was met with the first class taught by Patti Lyons Sensei. My training partners had no issue throwing me around the mat, letting me know exactly what I was doing wrong, and having benevolent patience with my mistakes. A gift indeed, as this is a recipe for growth through training. Before Summer Camp during my Sankyu test. As camp went on, I was challenged by every class. 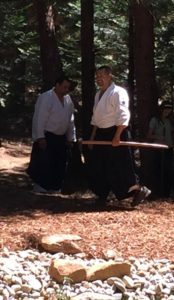 Each teacher provided a variety of techniques with a focus on the theme of “connectedness.” From tai no henko to iriminage to kokyuhos and kokyunages, we were guided in the form, details, and execution of each technique. I’ve never felt so much like a rag doll in my life! Each class was a download of information, a challenge for my body/brain connection, and a training of my ego (“Oh, I know this one! I can do this no problem”, only to realize that subtle variations make huge differences when it comes to doing exactly what was shown by the teacher). With each teacher having a unique set of talents, personality and teaching style, I appreciated the individuality of each class. You never know what to expect when you step on that mat, so relinquishing expectations was a great idea. By the end of the second day, I was formally indoctrinated into sweat, aches and pains. I think the only time I wasn’t sweating, was walking to and eating in the cafeteria. I had brought a bottle of analgesic oil for the aches and a tube of arnica for the bruises, using both each day to alleviate what I could. 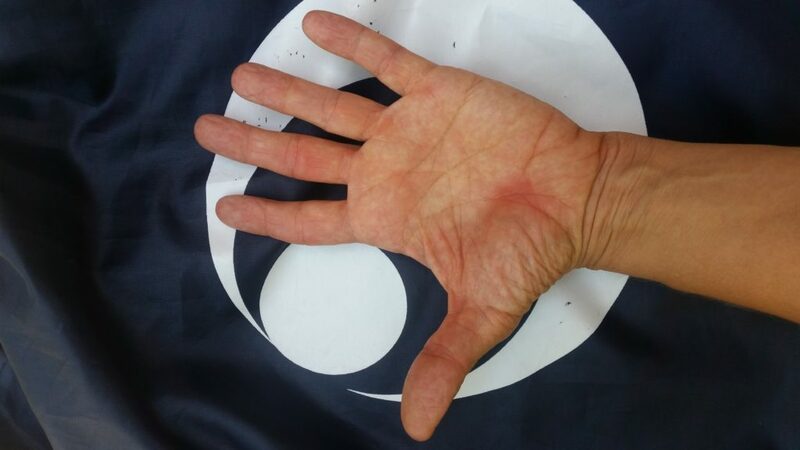 If you’ve ever been to camp, you are surely familiar with the heavy, achy and sore muscle groups: nearly every muscle and tendon communicated the need for self-massage, stretch or rest. Indeed, each received some form of the three, and bowing in to every class I wondered how I would survive! Ironically, as soon as I started to move on the mat, my body forgot about the pain, seemed to not remember the aches and bruises, and carried me through the whole class, only to reveal its presence again at the end of class! This was an interesting experience for me, because after each day I felt like I had been hit with a truck. The following day, I would bow in, turn on the brain, and let the body just follow along. Bokken impressions over the Birankai Summer Camp tote. The rest of the week followed this same pattern, wake, stretch, pain, then train. In between classes I had duties related to my new position, and was often being introduced to the key players who would help me in adapting to my new role. I was first introduced to the members of the Birankai Board of Directors during one of their formal meetings at lunch. After one class, Champion Sensei walked me around to introduce me to a few Sensei he thought I should know. I was introduced to the members of the Teachers’ Council during another lunch, allowing me to get an inside scoop of what happens behind the closed doors of our organization. Each evening was as unique as the classes. The week began with the mixer, full with music from talented fellow Aikidoists, a catered function with treats and sweets. The following night was a free night in the city exploring Central Park and Times Square. There was a memorial class for Chiba Sensei taught by Lynn Sensei, and the final evening of the farewell party was full of good food, short skits, a time of honoring each other for all the hard work, shared stories from students of their teachers, the annual fundraising raffle, and, of course, music and dancing. Everyone attending seemed to laugh and enjoy themselves while making fond memories for the future. The final day remained true to form with training, good people and many goodbyes. In the morning, we spent some time on the now mat-less gym floor in a class led by Stier Sensei, performing Tachiwaza exercises. After eating a final breakfast in the cafeteria, we walked back to our dorms ready to pack up and head home. Summer camp was a blend of excitement, bodily commitment, mental perseverance, strength and an open heart. With any training, it is important to honor all aspects of what has been taught, and what was learned. I feel blessed to have the experience of getting to train with so many dedicated Aikidoists. I took home new technique, and a fresh, revived attitude toward training. I know I am not alone in this. I would like to thank Savoca Sensei and Brooklyn Aikikai for all of their hard work in organizing camp this year. Summer camp would not have been possible without the dedication and efforts of the many hands involved with making this such a success. There were many behind-the-scenes responsibilities that made for the fluid and accomplished success of this year’s camp. As always, a huge gratitude is owed to the core teachers, our respected Shihan and all the instructors who brought their teaching to us during classes. Thank you to all, you have blessed our community with the gift of opportunity, training and fellowship.